In this blog we will take a look at the potential future uses of a Intel Realsense 3D cameras, some of which are currently being tested there required environment. Check out our previous post on what Intel Realsense is and how it works. Where could Intel Realsense 3D Cameras be used? Intel Realsense 3D camera technology brings an entirely new toolbox to many industries. Firstly let’s briefly cover some of the applications of Realsense 3D in devices. In this blog we will focus on the uses in tablet devices as the front facing/ webcam camera applications use a short range technology. They are uses for things like facial recognition and motion detection, popular within the gaming industry and education. And then machines such as drones use it for object detection and automation. Logistics and warehousing – For the measuring of boxes, pallets and stock, measurements can be calculated in less than a second. Medical –Monitor the depth and size of wounds, as well to track progress. Allowing greater efficiency and clinical decision making. 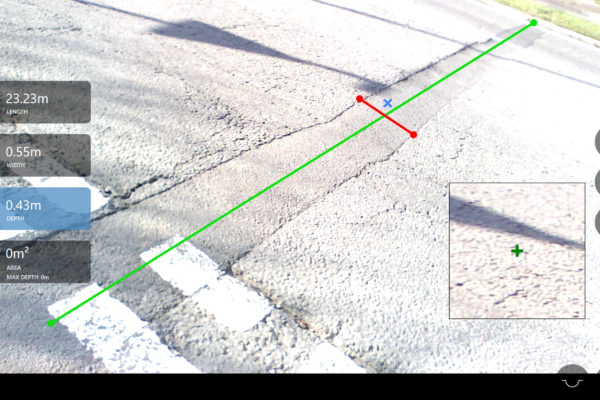 Highway maintenance – Calculate the total size of potholes, cracks and damages. This would give a more accurate measurement for reinstatement calculations and a better understanding of the damage to the surface. Surveyors and service engineers – For taking 3D scans of areas and environments. A more detailed result can be produces than typical measurements. Airlines – Allows passengers to accurately measure luggage before arriving at airport. Allows airlines to get a more accurate understanding of how much space is being used and provides an audit trail of checked baggage. If you are interested in the potential uses of 3D cameras in tablets then take a look at our units featuring the technology. We are sure there will be many other potential uses of Intel Realsense 3D camera in tablets and smartphones in the future. f you would like any more information or have any questions get in touch. When an enterprise has numerous mission-critical handheld devices deployed across their operation and a technology refresh is needed a change over strategy is key to a successful roll-out of the new devices so as not to cause disruptions in the supply chain. It is also important to ensure that mobile workers are familiar with the new technology and that any new software apps are thoroughly tested. Many companies are considering replacing their aging Microsoft PDA based devices and migrating to Android across their supply chains before the Windows Mobile OS end of life deadline at the end of 2019. MobileWorxs have added the Seuic Rugged Android Handheld and Tablet range to the product portfolio to give users a viable replacement option that combines affordability, quality and reliability Seuic will be incorporated into our sales support and workshop capabilities. China has the world’s largest manufacturing, e-commerce and logistics industries, and is also the largest market for barcode and RFID mobile computers. Seuic has high sales volume across 25 countries. As a result, we can benefit from the cost advantages of Seuic’s scalable production and help our users be more productive in their supply chain. MobileWorxs will initially focus on three products with more to come soon. These include the Seuic Cruise 1, which is a rugged smartphone suitable for field service, delivery and store operations. The Autoid 9, a rugged key-based PDA, will be a great drop-in replacement for legacy Windows mobile users in the general, as well as logistics and manufacturing industries. The Autoid Pad is a small tablet with a horizontal focus across many industry sectors. Get in touch to see how we can assist by doing an audit of your Windows Mobile assets and preparing an easy-to-adopt Android migration path that is affordable to deploy across the entire supply chain. 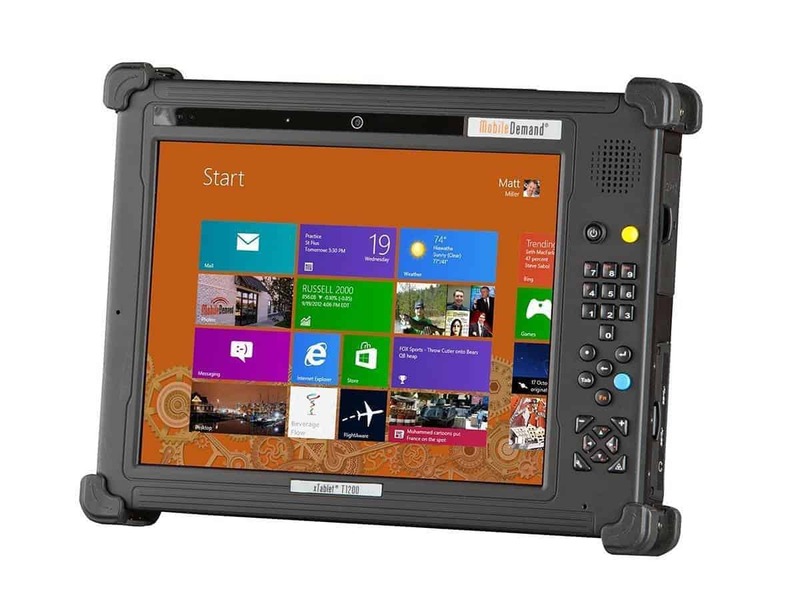 The Rugged Tablet T1200 End of Life has been announced. Due to shifts in technology and components soon to be no longer available, the device will officially be EOL on July 31, 2018. We are planning to continue full service support for the xTablet T1200 for three years following the EOL date. This is contingent on the ability to acquire replacement parts from component manufacturers. Due to the age of the device design we reserve the right to use refurbished replacement parts in the event that new parts become unavailable. Accessories for the xTablet T1200, including batteries, may continue to be purchased and will be sold on a first come, first served basis until completely sold out. Minimum order quantities may apply on certain parts. We are pleased to report that the MobileDemand family of innovative tablets is continually growing to ensure we are meet the needs of our customers and provide the right tablet for the job. There are several new products in 2018. The replacement for T1200 is planned to be released in June 2018. The 12.2” xTablet “T1270” features a 7th generation Intel i5-7200U processor and is potentially the fastest tablet on the market. T1270 is a next-generation device engineered specifically for the mobile workforce, offering a larger screen and boasting impressive productivity-enhancing options such as a 3D camera, 2D barcode imager, and fingerprint reader. T1200 will be available until July please check out the specs to see if this workhorse may be useful for your project. We encourage you to be in touch with any questions about the current and new products in the range or set up a meeting. We are adding to the mobile receipt printing catalog the innovative LK-P24 & P34 by Sewoo The ideal fit for mobile employees with busy schedules and tight deadlines. 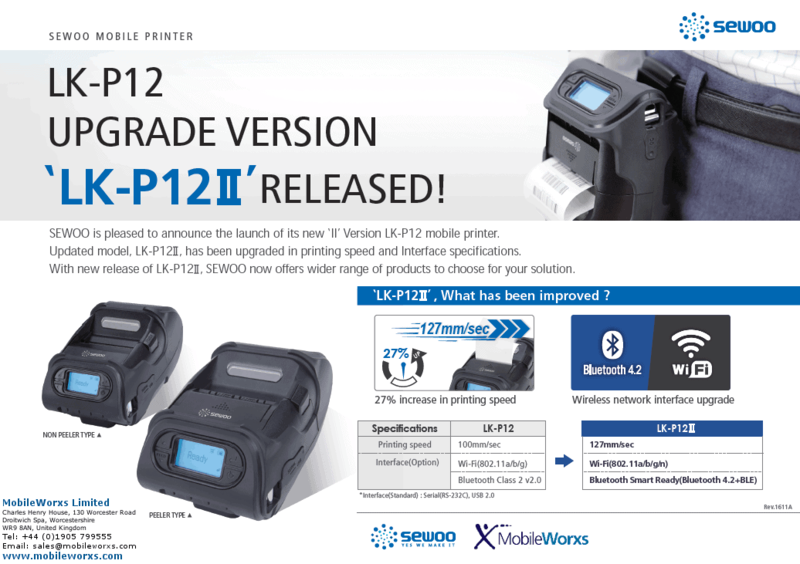 The LK-P24 & P34 are updated and improved portable receipt printers to which the guys at Sewoo have introduced a game-changing element: the world’s first semi-auto cutter ! This feature will enable the user to cut the paper more effectively upgrading the quality of the receipts printed. 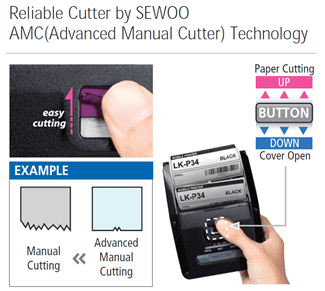 How is Mobile Receipt Printing Made Easy with Advanced Manual Cutter ? Smooth, simple and straightforward: click the button and cut. The exclusive Advanced Manual Cutter technology allows the user to deliver the receipt with more precision than ever cutting down on paper waste and maintenance costs and improving customer presentation. High speed: supporting 100mm/sec printing speed. Long battery life: LK-P24 : 1,510mAh, LK-P34 : 2,000mAh. Easy Bluetooth pairing through NFC function. Strong and solid design suitable for a variety of environmental conditions. All within a comfortably portable printer that aims to be more ergonomic for the user boosting employee productivity, effectiveness and accuracy – all with a simple click and cut! Sewoo are aiming to have the Advanced Manual Cutter shipping in April 2018. Get in touch to pre-book an evaluation unit. Long before iOS and Android Microsoft announced Windows CE in 1996. The OS was designed to operate satisfactorily on the small memory capacities of palm sized devices at the time. Although recognised by many as targeted at hand held computers many platforms ended up using derivatives of CE. In the enterprise mobility market Windows CE, Windows Mobile, and Pocket PC are often used interchangeably this is in no doubt in part due to their common origin. This practice is not entirely accurate. 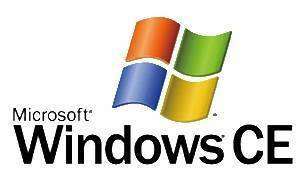 You can read more about the history of Windows “CE” here. and Windows “Mobile” here. A faltering mobile OS business hurt Microsoft for many years, although popular in the enterprise due to high adoption market appropriate hardware and plentiful development tools. Versions of the OS for phones had been losing market share since 2007. These EoL dates have been trailed by Microsoft for some time. For many users this will be something to discuss with their software vendor. The coming Microsoft Windows CE OS end of life may make little difference if the devices are working and no major system upgrades are planned. However as hardware itself becomes EoL and developer resource dries up it will be time to move on to something else. What that is very much depends on your circumstances, there is no one sized fits all approach. In a straight swap the top two options for many sites are clearly Android and Windows 10 but some may consider iOS. Don’t let the Microsoft Windows CE OS End of Life get the better of your operation. Call us to disucss how we can help you weigh up the options and plan for the future. 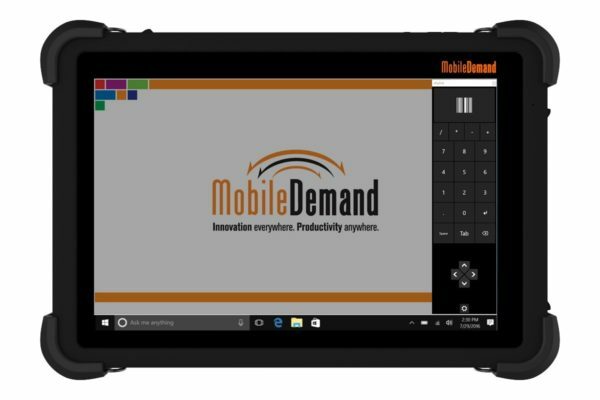 The folks at MobileDemand have introduced xKeyPad the Windows 10 Tablet Numeric Keypad and Barcode Scanning App. This revolutionary app provides a persistent numeric keypad and barcode scanning application in one. Auto-entry for fast and efficient use. Day or night vision modes. Left or right side positioning. Snaps to side of screen, allowing your working software to remain. Stays on screen, say goodbye to the annoying pop up Windows soft keyboard. Manually input numbers quickly and efficiently, without your keypad getting in the way. xKeyPad conveniently docks to the side of the screen that you prefer, working effectively with multiple applications. Other programs snap into place while xKeyPad stays where you left it. Your device no longer needs a dedicated built-in barcode scanner. xKeyPad utilizes your device’s camera to scan 25 different types of barcode symbologies. It has the capability for custom formatting, to make your mobile productivity even faster. Already have a built-in barcode scanner on your MobileDemand rugged tablet? No problem; you can purchase the xKeyPad base plan for just the keyboarding features. xKeyPad is not only for MobileDemand tablets. It will run on the Microsoft Surface or any other Windows 10 tablet. To learn more about the Windows 10 Tablet Numeric Keypad and Barcode Scanning App download an evaluation copy here. 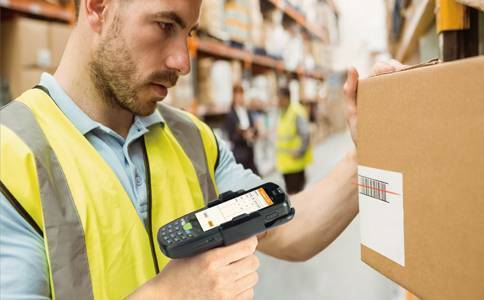 Enterprise mobility specialist MobileWorxs has added Sewoo thermal printers range of products to its portfolio to target receipt and label customers in the logistics, manufacturing and field service markets initially in the UK and later in the EMEA region. According to MobileWorxs MD, Andrew Cahill, rather than creating yet another value proposition based on the channel, they will primarily target end users who are new to AIDC and labelling solutions or alternatively, those who are refreshing installations that already exist. The Sewoo brand, established in 2002, is today recognised as a manufacturer providing users in 80 countries with a comprehensive range of desktop, mobile and label printers serving retail, field service, hospitality, transport and logistics, healthcare, manufacturing, and public sector markets. In, 2017 the company underwent a name change from Sewoo Tech to J. Stephen Lab Corporation with Sewoo as the brand. “The Sewoo thermal printers range is a good fit as we support mid to large OEMs to find a market for their products at the end user level by providing them with a complete in-region sales and support offering. This includes a UK-based repair workshop consumables supply and new ideas around financing and support provision,” he adds. To learn more about the Sewoo range get in touch. 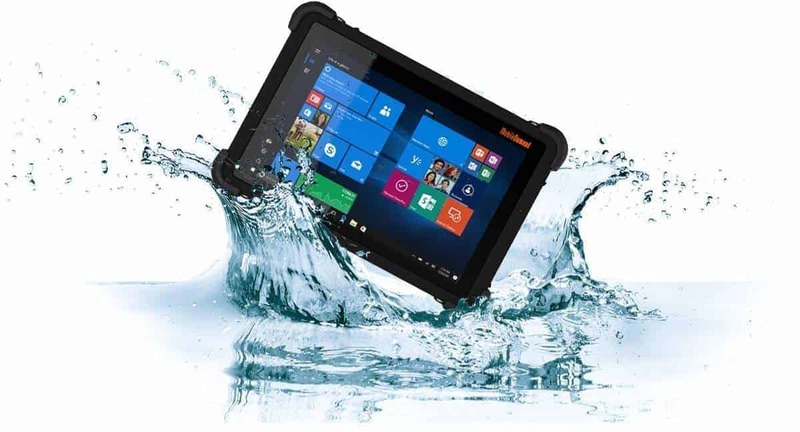 We are planning on two major additions to our MobileDemand Rugged Windows 10 Tablet portfolio before the end of 2017. The first one adds a new feature packed 10″ device to the range including removable high capacity battery, 4G comms and a high definition screen. Rugged PC Review were given an early peek to do a T1150 rugged tablet review in advance of public availability at the end of October. Fitness for the task is key with T1150. 4G Integral 2D and Intel RealSense 3D scanning are all options. Along with standard fit 2 cameras Wi-Fi and Bluetooth. “First impression matters, and the xTablet T1150 certainly makes a very good one. Here, the good/better/best certainly applies. 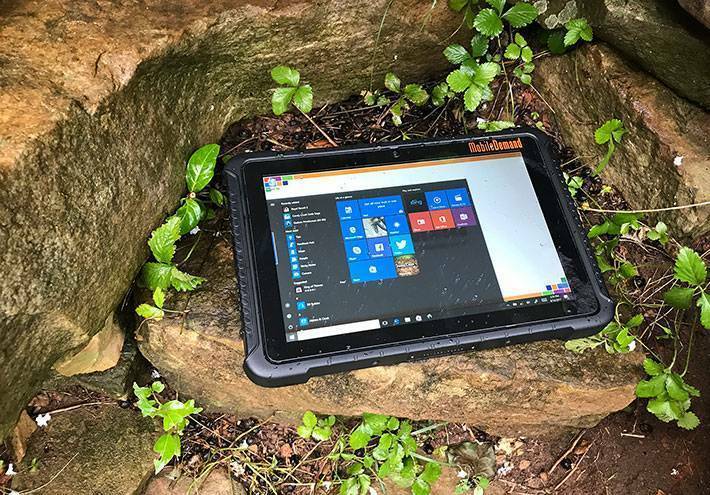 The T1550 is a true rugged design and certainly trust-inspiring, It looks and feels like a serious tool for the job, a rugged tablet that was designed from the ground up to handle the bumps and grind and drops that come with work in the field. There are hefty bumpers on all four corners, the kind that aren’t just a design element but clearly afford true real-word protection. There are all the doors, compartments, locks, hooks, loops and attachment and mounting points and details that one expects from a rugged tablet. There’s nothing wrong with the gleaming etherial sleekness of premium consumer tablets, but those are detriments out there on the job where the rubber meets the road. With the the xTablet T1150, form follows function, not fashion sense. Despite being in the same 10-inch display class as the standard Apple iPad, the T1150 is a considerably larger and heftier device. Some of that extra heft and size is due to a good deal of built-in protection, another to the presence of ports and integrated functionality. The display’s 16:10 aspect ratio is pleasant to our eyes, between the iPad’s squarish 4:3 and the narrow (or wide, depending on whether you use them in landscape or portrait mode) 16:9 aspect ratio favored by many non-Apple tablets. To learn more read the Review or take a look at the xTablet_T1150_Specs or get in touch with us to arrange a webinar or meeting about the T1150. With the demands and uses for mobile computers growing, manufacturers are constantly looking for ways to improve their products and beat their competitors. In this blog we will take a quick look at how the latest Intel RealSense 3D camera technology is making it’s way into tablets. Keep a lookout for our second post that will cover the uses of tablets with 3D cameras. Firstly, let’s take a look at what an Intel RealSense™ 3D camera is. RealSense camera technology uses a standard 2D camera for regular photo and video, along with an infrared camera and an infrared laser projector. The infrared components allow RealSense technology to determine the distance between objects, separating objects from the background layers behind them and overall allowing for largely improved object, facial and gesture recognition over standard cameras. At the point of writing this blog there are 3 different versions of Realsense 3D cameras, the F200, SR300 and the R200. Support for Hand and person tracking modes. R200 – Intel RealSense™ Camera R200 is a long range peripheral 3D camera. While front facing technology can be applied into mobile devices, we are more likely to see it featured in a rear facing specification. This is the unit that most tablets will feature due to it offering more real world uses. This camera opens up the potential of 3D technology to a whole new industry, using the same fundamental Realsense technology as above it brings new tools to developers and users that can save time, automate processes and create detailed visuals like never before. In our second blog we will take a look at the application for this camera, such as manufacturing plants road maintenance and in the medical field. We feel this technology can play a big part in the real world, automating processes, giving more accurate readings and increasing overall workflow. To learn more about the R200 Intel Realsense 3D Camera in Tablets take a look at the T8650 and T1150 or get in touch with us to arrange a webinar or meeting. Rugged PC Review carried out an xTablet T1550 Rugged Tablet Review when the device took over from the previous T1500 model. Affordable flexibility is the key with T1550. Integral 1D or 2D scanning GPS and NFC are all options. Along with 2 cameras Wi-Fi and Bluetooth a serial port is also a standard feature something not very common on devices at this market level. While the xTablet T1550’s processor and memory make concessions in the interest of affordable pricing, the tablet’s display definitely does not. Measuring a roomy 10.1 inches diagonally — it’s very noticeably larger than the 8-inch screen of the smaller xTablet T8540 — it offers WXGA resolution. That’s 1280 x 800 pixel in 16:10 wide-format — 30% more pixel that the 1024 x 768 XGA format that was commonly used in rugged tablets (even ones with larger screen sizes) for many years, and is still being used today. On a 10.1-inch tablet screen, that translates into 149 dots per inch (dpi), which is not very high by today’s standards, but still more than adequate. The xTablet T1550 uses 10-point projected capacitive multi-touch for effortless tapping, panning, pinching and zooming. We can’t think of many crucial operations that require more than just a couple of fingers, but Microsoft wants ten, and so ten it is. The display is of the IPS (in-plane switching) variety that makes for perfect viewing from all angles. We cannot overemphasize how important a wide viewing angle is for a satisfying, non-disruptive viewing experience. Older and lesser display technologies are prone to often dramatic color and contrast shifts when viewed from different angles, something that we don’t consider acceptable anymore. The xTablet T1550’s IPS display is totally immune to such shifts, which makes it a pleasure to use. And outdoors the display feels brighter than its listed 320 nits luminance rating. To learn more read the review take a look at the specs or get in touch with us to arrange a webinar or meeting about the T1550.